Scott Nicholls rides for Panthers in a cup final against Ipswich. Team manager Carl Johnson has called for ‘two more massive efforts’ as Peterborough Panthers bid to lift the SGB Championship KO Cup. The city club entertain East Anglian rivals Ipswich Witches in the first leg of a mouth-watering final today (October 22, 5pm) at the East of England Arena. The Panthers management team of (from left) Trevor Swales, Carl Johnson and Ged Rathbone. And Johnson accepts that building up an advantage is essential ahead of the return clash at Foxhall on Thursday (October 26) as the club bid to capture this piece of silverware for the first time in a quarter-of-a-century. Their only previous success at this level came way back in 1992. “It would be brilliant to lift the trophy again,” said Johnson. “That’s what we want at the end of a tough season. “We did superbly to put out the holders Glasgow in the semi-finals and now we need two more massive efforts to finish the job. “These are the sort of big meetings that we work hard all year to be involved in and I’m confident we can put in performances worthy of the occasion. “First and foremost we need to win today to put ourselves in the best possible position for the second leg. Johnson will only have four of his own riders available again for the first leg. Number one Jack Holder and second-string Bradley Wilson-Dean have both failed to recover from illness, while reserve Tom Bacon is out after shoulder surgery. 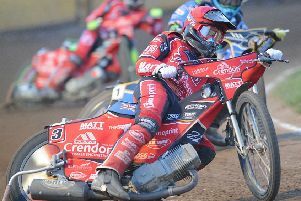 Seven-time British champion Scott Nicholls has been booked to cover for Holder, while Scott Campos, of National League side Isle of Wight, steps in at the bottom of the order for Bacon. The rider replacement facility will be in operation for Wilson-Dean which means another busy afternoon is ahead for high-scoring reserve Simon Lambert. Ipswich are boosted by the return of two riders - Rory Schlein and Kyle Newman - from injury, but they also operate rider replacement for Justin Sedgmen. Panthers have picked up a pair of narrow home wins against the Witches (46-44 and 48-42) in the SGB Championship this season, but they have lost in both of their visits to Foxhall. They went down by 28 points back in April and were seen off by 11 points in August. Ipswich, who are bossed by local man Ritchie Hawkins, finished as runners-up to champions Sheffield in the SGB Championship Grand Final. PANTHERS: Scott Nichols (guest), Rider replacement for Bradley Wilson-Dean, Paul Starke, Ulrich Ostergaard, Chris Harris, Simon Lambert, Scott Campos (guest). IPSWICH: Danny King, Rider replacement for Justin Sedgmen, Cameron Heeps, Kyle Newman, Rory Schlein, Nathan Greaves, Connor Mountain.